Just down the road from where I live- in the old town of Hojo, in Tsukuba City, there is an old post office which has been renovated and turned into a restaurant/cafe appropriately named POSTEN ( which is Swedish for post office). Its a good place to visit any time any time of year, but I find that in winter it is especially inviting ( as a refuge from the bone-chilling cold outside AND inside my house). Not only does this establishment offer the physical heat created by kerosene heaters, but it provides a deep aesthetic warmth with its beautiful deeply- hued wood flooring and ceiling beams. Then, in addition to having a nice selection of coffees and teas to warm your insides, the menu lists a drink made with an ingrediant which has long been known ( and cherished) in East Asia and other parts of the world for its WARMING qualities- freshly made ginger ale, served up either hot or cold. The other day I was at Posten again with 3 friends. When I pointed out the ginger ale on the bill of fare, they all all joined me in ordering some ( though I went for cold and they for hot), commenting that some ginger would be good for warming the body AND preventing colds and the flu. When we got our drinks we all savored the sweet sting and burning sensation with each sip that we took. One member of our party, however, Keiko-San, insisted that though she was enjoying her ginger ale- she could do much better. Knowing Keiko, I believed her. 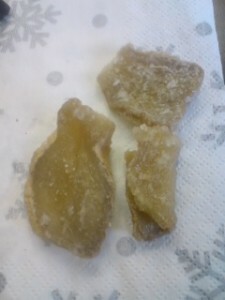 AND I was not surprised that when I met her the next week she brought with her a bag full of home-made ginger chews. 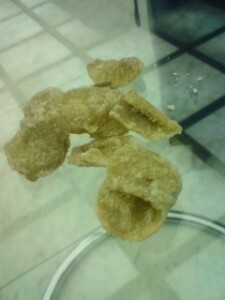 When I bit into one I was struck by the soft chewiness and the deeply earthy ginger flavor. Soon, however, the sensation went beyond merely taste and texture as my throat and chest were washed over with a warmth which reminded me of the VAPOR RUB my mom or grandma would rub on my abdomen when I was sick with a cold or flu as a child. At first I thought that one small piece would be enough, but after a few minutes, when the heat effect started to die down, I could not resist going for another- and then another! By evening I had finished the whole bag ( though I had, in the desire to share the experience with others, given out a few to friends and acquaintances). Not wanting to impose on Keiko-San by asking her to make me a new batch, I instead asked her ( begged her) for the recipe. Though its origins are believed to lie somewhere on the Indian Subcontinent, ginger has been cultivated in Japan since at least as early as the Heian Period and it has long been appreciated for its flavor and medicinal powers. Today, it is in Kochi Prefecture on the island of Shkoku where a large portion of Japan`s ginger is grown. If you are fond of Japanese cuisine you have surely had ginger in various forms. It is an important part of the sushi experience as the pinkish pickles( called GARI)) which are either served on your wooden pallette or are available on your table or counter ( free refills are given if so desired). A dab of grated ginger is also put on certain sushi toppings ( especially SABA) and on some sashimi ( most importantly KATSUO- bonito). The reason that ginger and wasabi ( Japanese horseradish) have become so connected with sushi and sashimi dining is that it was realized ( or believed) that these accompaniments to raw fish reduced the number of food poisoning cases back before the age of refrigeration. Ginger also helps eliminate FISHY ( namakusai) smells. Grated ginger is also an iconic topping ( along with negi and soy sauce) for hiyayako- a chilled block of tofu. One of my favorite ways of experiencing ginger in Japanese cuisine is at certain IZAKAYA ( Japanese style pubs) which give all customers as they sit down to a table ( or counter) some young ginger roots for dipping in miso pastes ( one place in Tsukuba where they do this is at JIBUN KATTE, an Izakaya near Matsumi Park. But over the centuries, pobably the most popular ( or celebrated ) use for ginger has been as an additive (grated) to hot sake- to prevent or help treat colds. Also, probably of this idea of connection with disease prevention ( it is also believed to be good for stomach trouble, nervous conditions and an assortment of other ailments), ginger has become an important symbol of certain Shinto Shrines where on certain festivals ( or at certain ceremonies) ginger roots are sold as amulets (like the garlic at Tsukuba`s Ichinoya Shrine) or are presented as offerings to the deities. Some of the better known GINGER SHRINES are the HAJIKAMI JINJA SHRINE in Kanazawa which has a ginger festival in June, and the DAZAIFU TENMANGU SHRINE in Fukuoka Prefecture at which ginger is sold an an amulet to keep misfortune at bay. Im not sure if ginger really does CURE colds, but anyway- it sure does taste, and FEEL good!